When it comes to baby gifts, the best way to express your care is a crocheted blanket. Whether it is sophisticated and modest or bright and fun, an infant blanket can become a heirloom that is cherished and passed down from generation to generation. It is a very old tradition to keep baby blankets and display them in the adult years. Blankets can take a few weeks to make, but they are definitely worth it. In fact, the majority of free patterns are simple for new crochet enthusiasts, as well as for intermediate crafters. Actually, you may simply learn how to crochet a blanket with one of the easy patterns in this collection. Browse for a project that can become a perfect gift for a toddler and new parents. Use their favorite colors, choose the perfect thread, add a few personal touches, such as beautiful edging and start crocheting. You can’t go wrong with our simple crocheted baby blankets patterns. The best type of thread for an infant has to be the best choice for the season: newborns do not overheat and cannot control body temperatures or get rid of extra covers. Hence, any crocheted blanket has to suit the season perfectly. Pay attention to the washing recommendations: new mothers should not waste their time on hand wash. Hence, an infant blanket should not only be machine washed but also should withstand 40C water temperature as a minimum. The perfect choice is cotton yarn, commercial sock yarn, linens and some wool blends. Perform a destruct testing: this point is closely linked to the previous one. Easy crochet baby blanket should be used and, obviously, washed. If new parents can’t wash it they will never actually use it. It’s worth mentioning that you should not entrust the label. Make a small testing sample and wash it. Many washing machines take water right from a tank and have no integrated thermostats. Thus, a wash labeled 40C can be far hotter. Due to hot temperature wool can felt and synthetic yarn like acrylic may go limp. Once ruined, they cannot be recovered and the crocheted item becomes floppier and less aesthetically pleasing. Keep away from unknown yarns or the threads that shed: infants taste everything they can reach. No new mother wants to see her baby swallowing a piece of yarn. So, baby blanket should be made of smooth and not fluffy thread. Weight of the thread has to correspond the size of the completed item: it’s quite clear, but many newbies forget about this rule. If you fold an infant blanket in half and cover a baby that counts as 2 blankets. So, there is no need to crochet too large item. Too large blankets need to be halved or quartered and are too warm, which may not be a perfect choice for hot summer months. Don’t fear to demonstrate your newbie status. Every crocheter has to learn basics, and simple baby blanket is a great place to start. Even inexperienced crafters can crochet blankets for little boys or girls. Use the skill you already possess and search for patterns that will help you improve your techniques. 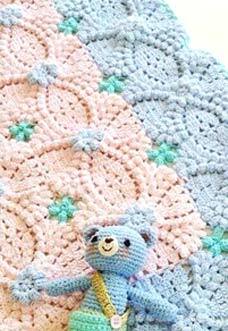 Crocheting baby blanket can help you discover your internal crochet expert. Apply motifs, ruffles and other fun details to personalize the blanket.